Gambling losses do not impact your tax return nearly as much as gambling winnings. Losses only partially offset the tax effects of gambling winnings. Even a win of a few thousand can have unintended effects, costing you more in taxes than what you won - even if you have gambling losses to offset it. Casinos are required to report gambling winnings if they exceed a certain limit ($1,200 of slot machine winnings for example). Gambling winnings get reported on the first page of your tax return on line 21. Once you report gambling winnings, you can also then report gambling losses. Gambling losses get claimed as an itemized deduction, in section 28 in “Other Miscellaneous Deductions”. You are only allowed to claim losses up to the amount of winnings. This means if the casino reports $50,000 of winnings, but throughout the year you gambled a total of $60,000, winning back $50,000 but losing $10,000, you can’t claim that $10,000 loss on your tax return. In order to claim losses, you must keep gambling records and receipts. Yes, you do get to deduct the losses so you don’t pay income taxes on the winnings, but that is only part of the story. The rest of the story has to do with how gambling winnings affect your Modified Adjusted Gross Income (MAGI). As gambling winnings are reported via the first page of your tax return (with total winnings being reported before they are offset by losses) this has the effect of increasing your MAGI. Your MAGI is calculated before you get the benefit of reducing it by any itemized deductions such as gambling losses. So gambling winnings increase your MAGI - even if you didn't actually win anything when comparing winnings to losses. Other tax calculations are compared to your MAGI to determine whether you pay more tax in other areas or lose out on some deductions. An increased MAGI can mean you pay more in other areas and/or lose out on some deductions. Your eligibility to make a Roth IRA contribution (or deductible IRA contribution if you are also a participant in a company sponsored retirement plan). Too much MAGI and you are not eligible to make a Roth IRA contribution. The amount of your Social Security benefits subject to taxation. A larger MAGI means more of your Social Security can be included as taxable income. The amount of Medicare Part B premiums that you pay. Too much MAGI and you will pay a larger Medicare Part B premium. Phaseouts of exemptions and itemized deductions. Higher MAGI means you may lose some of your exemptions and deductions. Applicability of the 3.8% Medicare surtax on investment income. If your MAGI is high enough, you will pay an additional tax on investment income. Your eligibility for a tax credit/subsidy for the purpose of purchasing health insurance. If your MAGI remains low enough you may qualify for a tax credit. Gambling winnings could make you ineligible for this. Let’s take a look at an example of how gambling winnings affected some of the items above for one retired man in his early 70’s. David (name changed for privacy) is in his early 70s and lost his wife many years ago. He still works part-time in his business which is now primarily run by his son, and by the looks of his tax return, I am guessing he spends the rest of his time at the local casino. Why would I guess this? Last year he reported over $550,000 of gambling winnings on his tax return. Lucky guy, right? Not really. He reported the same amount in losses. David’s MAGI would have been less than $80,000 without gambling. Instead, it was over $630,000. Rather than paying Medicare Part B premiums at $105 a month he’ll be paying $335 a month; an increase of $2,760 per year. In 2013 this MAGI level caused him to lose about $11,400 of his itemized deductions, costing him another $2,850 in taxes (at the 25% marginal rate). Even if his gambling habit is a wash, it will be costing David thousands extra each year in taxes. This hidden gambling tax can affect both lower income and higher income retirees but in different ways. For lower-income retirees, a hidden gambling tax can occur because increased MAGI increases the amount of your Social Security benefits subject to taxation and reduces your eligibility for a tax credit on health insurance. For higher-income retirees, the hidden gambling tax may come in the form of a loss of deductions due to the phaseout limits, increased Medicare Part B premiums, and/or the applicability of the 3.8% Medicare surtax on investment income. 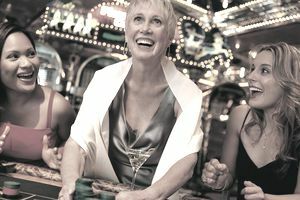 Keep in mind, a well-designed withdrawal strategy in retirement can help make sure you don’t pay any more taxes than you have to - but one trip to the casino can throw the plan off track.